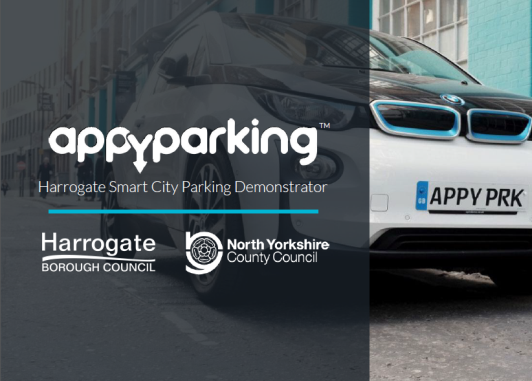 North Yorkshire County and Harrogate Borough councils have launched a joint initiative to create the country’s first ‘smart parking’ town in Harrogate from November 1. (This is the first of a number of joint initiatives under the SMART Harrogate programme.) Initially on an 18 month pilot basis. Working with Appy Parking, the town will see parking partly managed by 1,600 surface-mounted BlueTooth sensors in all street parking bays and off-street surface level car parks. The first ‘smart parking’ app is set to be launched in Harrogate, offering motorists the chance to be guided to available spaces and pay for exactly the time they stay. The solution identifies available spaces, provides cost information and assists navigation to the most suitable parking space. On arrival motorists can start their parking session via the AppyParking app or can choose traditional pay and display machines. When using the AppyParking app, the motorist does not have to predict how long they will be in the bay and the session automatically ends when the car leaves the bay. Smart parking should significantly improve parking and traffic management, reduce pollution, support the visitor economy and enhance user experience, by using the data provided. Being at the forefront, with Harrogate Borough council, of the initiative to have the first town in the country to implement a holistic SMART parking solution. Collaboration with Harrogate Borough Council. The first of a number of SMART initiatives for Harrogate that both councils are working on. These include; Public WiFi, LPWAN, Wayfinding apps etc. The expected benefits are; Improved traffic management, reduced congestion/pollution, new opportunities around data-driven real-time town centre traffic management, enhanced customer insight, optimisation of operations and enforcement activity, national/global recognition as a progressive, innovative, ‘smart’ place, reduced cash management, real-time data and insight to improve event management and faster turnover of bays. Make sure you have enough time and resources to implement something. Plan well and make sure key stakeholders are involved at the appropriate time. Make sure contracts with suppliers are correctly worded to ensure your projects are a success.